This whisky has won a gold medal for Best Single Malt in the category for Scotch Whiskies aged from 13 to 20 years old, at the World Whiskies Awards 2019. Lagavulin offers the most intense, peaty and rich whisky from the Classic Malts Selection. Lagavulin is marked by the peat smoke and iodine, signature of the southern coast of Islay. The aromatic richness expressed makes it a bewitching spirit. 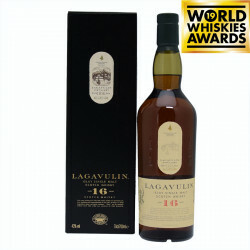 Lagavulin 16 years old is a Single Malt aged in oak barrels for at least 16 years that possesses intense flavours, smooth and smoked at the same time, from which rise notes of marine seaweed and dried fruits. This Classic Malts & Food gift box allows you to discover new flavours around richness and diversity of Single Malts Scotch whiskies. For exemple, the alliance of Lagavulin 16 years old and the french cheese roquefort is like a clash of the titans. This sheep cheese, both intense, tender and salty, is an exceptional product. With this Single Malt a real alliance is born, thus linking Scotland with the french region of Causses. The strong character of both products are competing in a surprising harmony in order to offer to your palate an exceptional roundness and smoothness with woody and peaty notes. Nose: strong peaty hues and seaweed, over a deep woody backdrop. Palate: mellow and intense at the same time, the dryness of the peat smoke overtakes the mouth and is then engulfed in a salt water wave mingled with woody flavours. Finish: everlasting and elegant peaty finale, a walk on the beach after the storm. Gold Medal, Best Single Malt, category Scotch Whiskies aged from 13 to 20 years old, World Whiskies Awards 2019. Double gold medal, for whiskies aged between 13 and 19 years old, San Francisco World Spirits Competition 2018. Best Islay Single Malt, World Whiskies Awards 2008. As an appetizer, Lagavulin and Roquefort cheese confront each other on the taste arena but neither of them takes over. One of the greatest food pairings.